You'll be £8.75 closer to your next £10.00 credit when you purchase Victorians and Edwardians Abroad. What's this? ‘Victorians and Edwardians abroad: the beginning of the modern holiday’ reveals a story never told before: the early years of one of Britain’s leading modern travel agencies, the Polytechnic Touring Association (PTA). Created in 1888 within Britain’s first Polytechnic, the PTA was an emblem of the era. It served a growing mass of middle-class and lower middle-class consumers, who found for the first time that they had the time and money to take extended holidays, often abroad. This book explains the creation of the Polytechnic and the PTA, charting the expansion of the travel agency into continental Europe and beyond. ‘Victorians and Edwardians abroad’ uncovers the recollections of those who went on ‘Poly holidays’ before 1914: how they experienced the journeys, what they did when they reached their destinations and what they thought holidays should be about. For all the serious strictures from their social ‘betters’ about the educational and ‘improving’ aspects of travel, PTA holidaymakers enjoyed themselves: liberating pork pies from train carriages, annoying foreign policemen and even beating the German Emperor to the last horses in town. Letters, articles and diaries of Poly holidays reveal a penchant for fun, even naughtiness, not often associated with the Victorians and Edwardians. Also included are a selection of postcards, photographs and promotional items from the PTA archives. 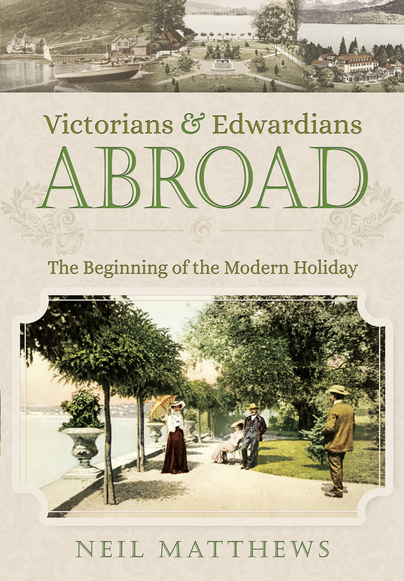 Victorians and Edwardians abroad is a fascinating glimpse into holidays as they were, just over a hundred years ago. An informative and enjoyable read, reporting an exploration of the formative years of the Polytechnic Travel in the late 19th and early 20th century. Overall, I thought this book was pretty good. It would be especially interesting to people doing Family Historical Research, or interested in the attitude of leisure time of the Late Victorians and Edwardians. This is an engaging history for which Matthews has looked at brochures, leaflets, guide books, memorabilia and a wealth of postcards, some of which are copied with that delight - the written side also reproduced, so we have authentic voices from the past. Neil Matthews was born in London and read History at UCL and the University of Westminster. His research into the Polytechnic Touring Association has been featured in Educating Mind, Body and Spirit: the legacy of Quintin Hogg and the Polytechnic, 1864-1992 and in Leisure Studies. Neil is also an award-winning travel writer, with articles in Best of British, Optima and elsewhere. His travel book Journeys from Wimbledon Common was published in 2012. By profession he is a Chartered Marketer, specialising in not-for-profit roles.